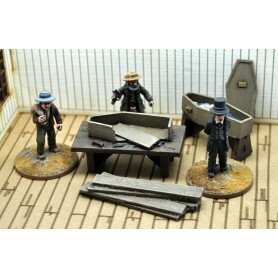 Set of four metal models designed for the DMH 4Ground Gallows. Models supplied unpainted. Part of a new range of civilians sculpted by Martin Baker to complement the DMH 4Ground buildings. We recommend that you undercoat and fix the hanging man in the noose before painting this figure. Gallows not included but available separately.